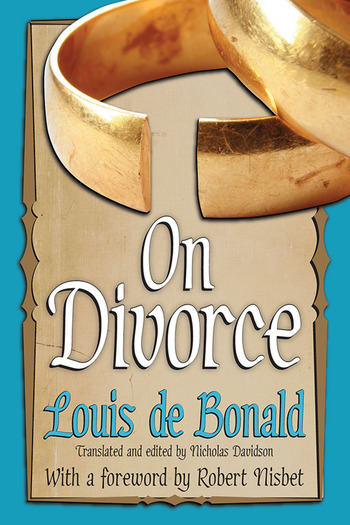 On Divorce is an anti-divorce treatise by Louis de Bonald, originally published in 1801 in response to the institution of divorce in France in the aftermath of the French Revolution. Examining the social structures of Christians, Jews, Asians, Greeks, and Romans, On Divorce links a theory of the family to a theory of politics and argues the family is a basic component of a stable society. As a politician, Bonald gave a crucial anti-divorce speech in the French legislature that summarized the argument of On Divorce. Due largely to Bonald's efforts, France abolished divorce in 1816. According to Bonald, human society is composed of three interactive societies: religious society, domestic society (the family), and public society (the state). These societies operate on common principles and can only be analyzed in relation to one another. Since, in this view, the family, not the individual, is the basic unit of society, divorce represents a fundamental assault on the social order. Bonald was one of the three principal founders of conservatism, along with Edmund Burke and Joseph de Maistre. Bonald's influence has been felt across the political spectrum and in areas as diverse as political theory, sociology, and literature. Of great interest to students of political philosophy, this work will be of equal value to those concerned with divorce and other social questions.